This Demonstration shows the effects of Tafel kinetics, ohmic potential drop, interfacial capacitance, and amplitude/frequency of sinusoidal potential signals on the nonlinear impedance of electrochemical systems. 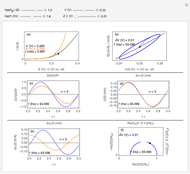 The plots show (a) steady-state polarization curve ( ) and curve ( ) corrected for ohmic drop; (b) Lissajous plot under sinusoidal perturbation of potential; (c) potential perturbation and effective interfacial potential scaled by input signal amplitude; (d) periodic current and its fundamental component; (e) faradaic and capacitive contributions to the total current; and (f) Nyquist plots of the usual (linear) impedance ( ) and the nonlinear impedance ( ), scaled by the low-frequency linear resistance. 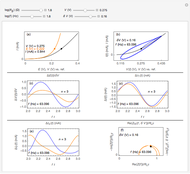 The usual impedance of electrochemical systems, defined under small-signal conditions, depends on the steady-state conditions and the frequency ( ) of sinusoidal perturbation signal. The effective (nonlinear) impedance, depends, in addition, on the amplitude of the input signal, given the electrode potential . The example of Tafel kinetics, , is dealt with in this Demonstration, together with ohmic drop ( ) and interfacial capacitive ( ) effects. The modifiable parameters are the steady-state potential imposed ( ), the ohmic resistance ( ), the amplitude ( ) of the sinusoidal input signal, and its frequency ( ). The other parameters ( , , ) have fixed values. (a): the steady-state current-potential curve ( versus ), shown in black, is compared to the same curve corrected for ohmic drop ( versus ), shown in orange. (b): the Lissajous plot (blue), vs. , starting from steady-state conditions (black), is used to observe the linearity or nonlinearity of electrochemical system behavior. 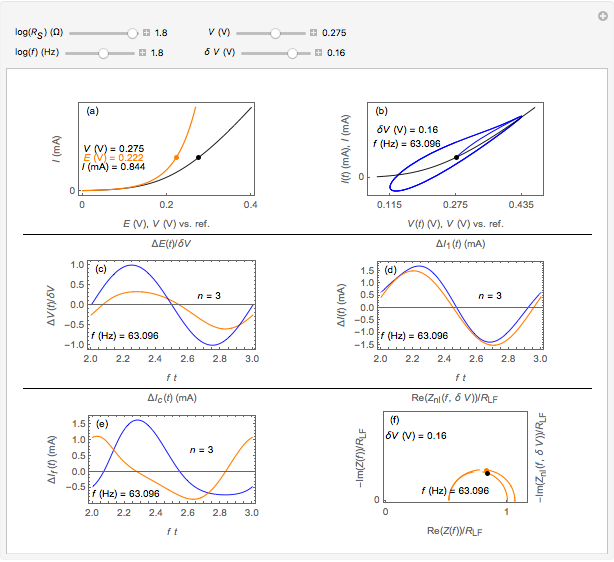 (c): the potential difference at the electrolyte/electrode interface: (orange) is compared to the input signal (blue) under periodic conditions ( cycle). The symbol represents the deviation from steady state. (d): the periodic current (blue), as well as its fundamental harmonic component (orange), obtained by Fourier series expansion, are plotted over one cycle as a function of dimensionless time. (e): The faradaic (blue) and capacitive (orange) contributions to the total current variation are plotted under periodic conditions ( cycle). 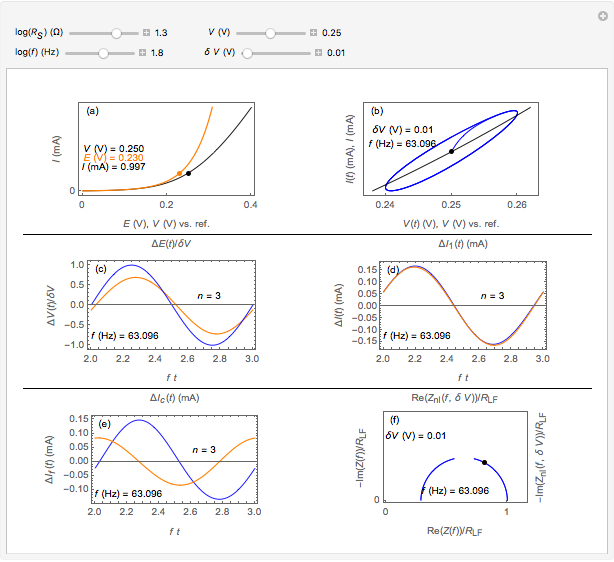 (f): Shows the Nyquist representation of the usual impedance (black) and the nonlinear impedance (orange) of electrochemical system, with . Both impedances are dimensionless after division by the low-frequency linear resistance . The influence of nonlinearity of electrochemical systems on the impedance evaluated at low frequency was examined in [1–3]. The influence of signal frequency was dealt with in . The effect of ohmic drop was investigated in . J.-P. Diard, B. Le Gorrec, and C. Montella, "Deviation from the Polarization Resistance due to Non-Linearity. I- Theoretical formulation," Journal of Electroanalytical Chemistry, 432, 1997 pp. 27–39. J.-P. Diard, B. 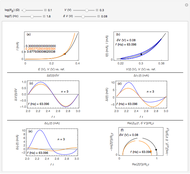 Le Gorrec, and C. Montella, "Deviation from the Polarization Resistance due to Non-Linearity. II- Application to Electrochemical Reactions," Journal of Electroanalytical Chemistry, 432, 1997 pp. 41–52. 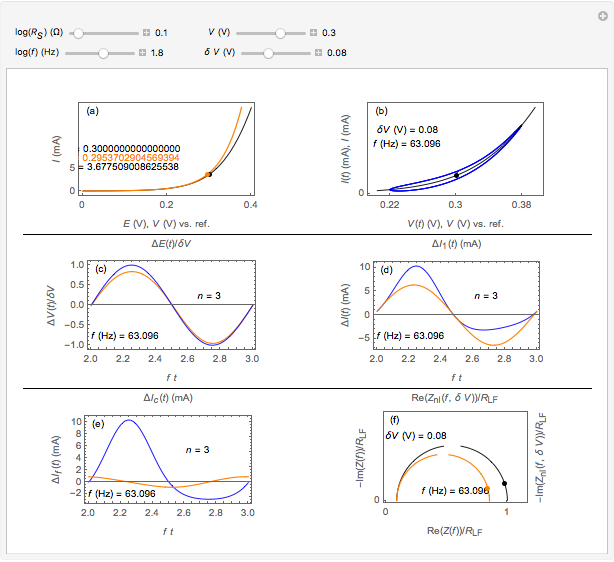 C. Montella, "Combined Effects of Tafel Kinetics and Ohmic Potential Drop on the Nonlinear Responses of Electrochemical Systems to Low-Frequency Sinusoidal Perturbation of Rlectrode Potential - New Approach using the Lambert W-function," Journal of Electroanalytical Chemistry, 672, 2012 pp. 17–27. M. E. Orazem and B. Tribollet, Electrochemical Impedance Spectroscopy, Hoboken, NJ: John Wiley & Sons, 2008 p. 134. Claude Montella and Jean-Paul Diard "Nonlinear Impedance of Tafelian Electrochemical Systems"